Published 2015/02/28 in Electronics. Updated 2015/02/28. This has been a long time coming! Despite the passage of time and technology, I have always liked the 733Mhz Pentium 3 machine known simply as the Xbox. With the amount of gaming time I get it's hard to justify splashing out on anything newer. But hardware ages - especially the human-facing bits. 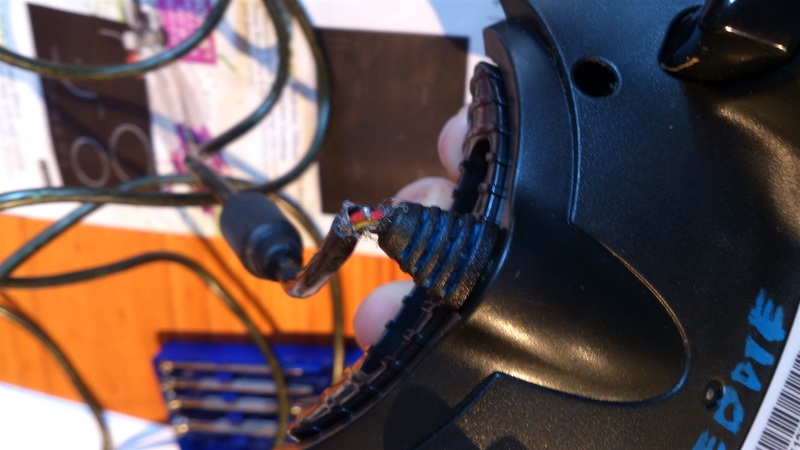 Such was the case with my first controller, whose power lines were getting more flaky with each winding and unwinding of the controller's cable. One August afternoon it was time to bite the bullet and see if anything could be done - probably sacrifice a little bit of cable to do a cut and patch of the faulty lines. Taking the front panel off revealed some interesting components. Under the six button pad on the right was a single large contact area - I can only assume that the onboard processor (large chip in the photo below) does some interesting inference from resistance to work out which buttons are down at a given time. 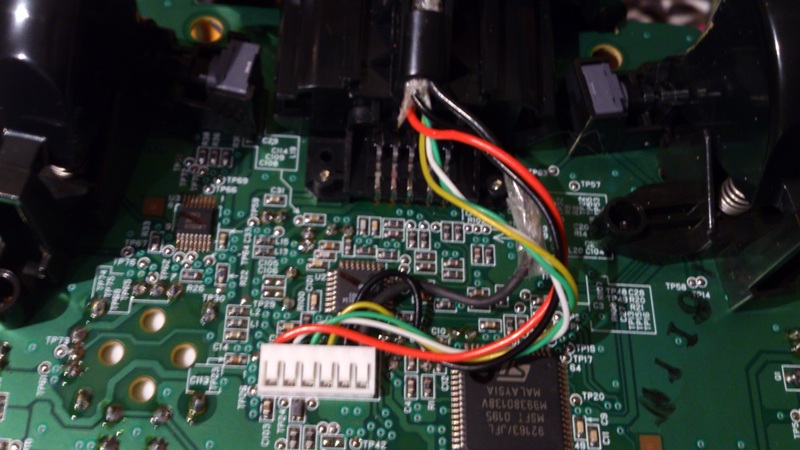 However the part of interest was on the other side of the PCB. Detaching the rumble motor cables wasn't much fun... 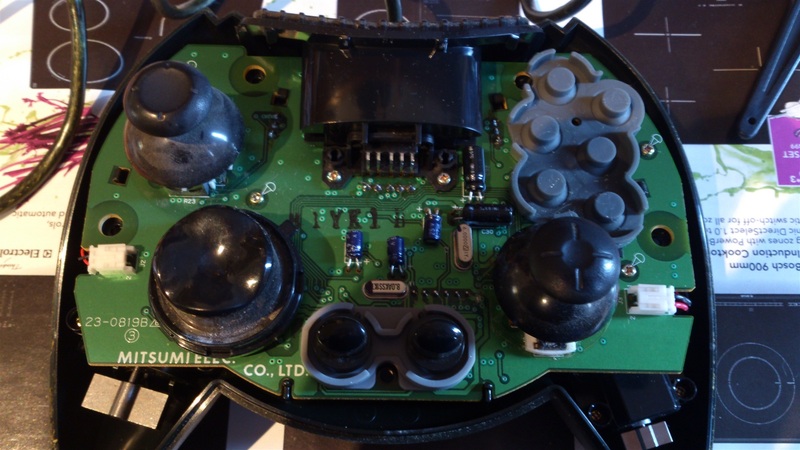 The underside of the controller hosts a six pin socket to connect the cable running back to the console. Even though the connection is based on USB, it looks like much more than the socket changed. In the photo above we can see a thick red line (the faulty one) and a thick black line handling power. That makes sense - running two rumble motors plus accessories would take much more than the 2.5W that stock USB could provide. Interestingly we have a thin black line (presumably signal-ground, likely tied to the power-ground line somewhere in the console) and what appear to be three signal lines. Perhaps one is dedicated to sending button presses back while another is the accessory upstream data line? That would leave one downstream signal line. Who knows? The photo above shows the controller after I did my hack job of patching both power lines. In the end I did sacrifice some cable length so I could cut the bad line and solder it back together inside the case. This fixed the break in the red +ve line, and to be neat I also cut and patched the black ground line. Before I got to it there was a very neat termination of outer layer and cable shielding under some heavy shrink wrap, and that shielding was thoroughly tied to the power-ground line. The guys at Microsoft who designed the controller connection did a very good job in my opinion. The cables and controllers for the original Xbox feel quite substantial and well made, especially when compared to something like the 1st generation Playstation controllers. Come to think of it, the whole thing (for better or worse) feels like a tank when compared to its peers. I did my best to re-link the shield to the power-ground line - it shouldn't really matter, but I may as well try to avoid needless sources of interference.